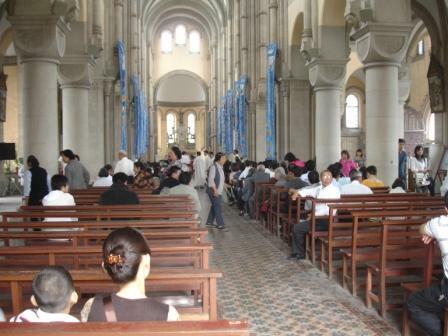 Ever since, Chinese religious authorities have been trying to figure out how to handle the massive crowds expected at the Shrine (roughly an hour outside of Shanghai), not to mention the implications of Chinese Catholics praying in unity with Rome. 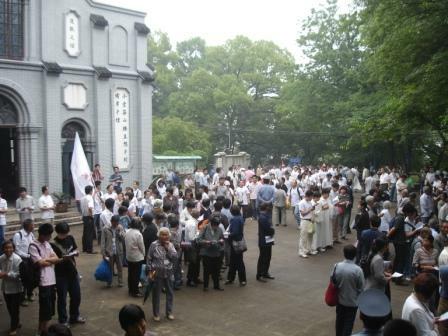 As noted here, and elsewhere, prior to the pilgrimage, the authorities placed restrictions on groups traveling to Sheshan, and even announced the closure of roads going into the Sheshan area. Well. 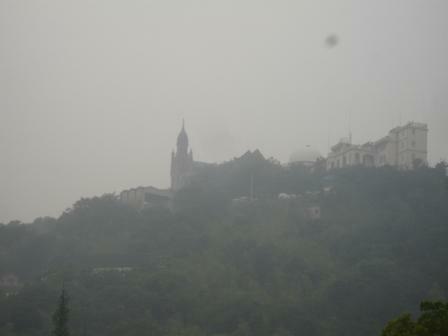 I spent last night in the Sheshan area, under the assumption that I wouldn’t be able to reach it this morning via car. I was wrong. As I set out on a 3km walk to Sheshan hill, I was passed by cars, trucks, buses and many, many police cars. At the gate to the stairs, which climb the 100m mountainside, there was also a security presence, but nobody was being stopped (I could see metal detecting batons in a tent behind the gate, but they were idle). 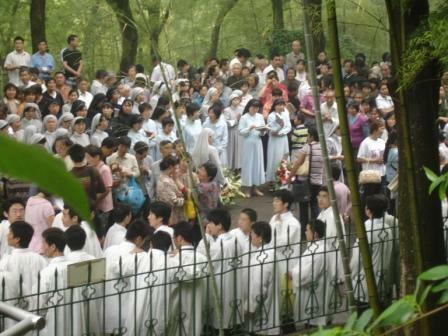 Around 8:15, the diocese’s sisters and novices began to gather near the lower-level shrine, and at 8:30, the priests of the diocese, followed by Auxiliary Bishop Xing emerged from behind the lower level church, and processed down to the area where the sisters had already congregated. Below, sisters, with seminarians in the foreground. 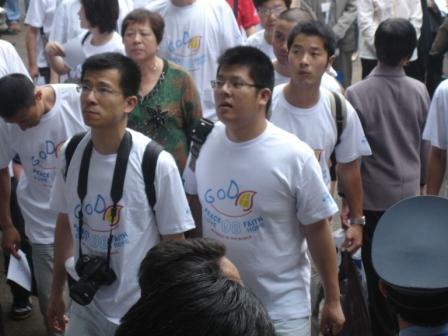 After a brief prayer, the group – led by Bishop Xing – began the short climb to the basillica. Finally, a photo inside of the basillica, taken roughly 90 minutes before Bishop Aloysius Jin Luxian was to say the 10:00 AM mass. 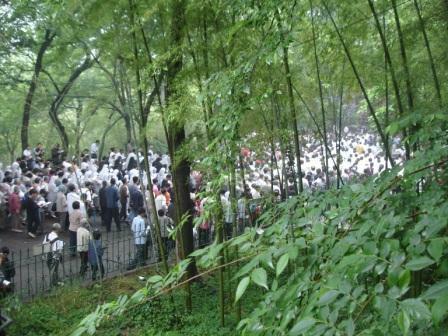 By a long shot, the security presence at Sheshan was the heaviest that I’ve ever witnessed in China. Uniformed police were common, but even more common – nay, ubiquitous – were men with ear pieces (I’d estimate that 1 in 15 people on the hill were security-related). Enough ear pieces to stock several mobile phone stores. Needless to say, this made me very uncomfortable – as did the large number of people who appeared to be taking my photo. To be fair, I stuck out. Among the thousands on the hill at that early hour, I was one of only four Caucasians. The other three were quite obviously press photographers, and they were working as a pack (at least, when I saw them), rendering their presence about as discrete as an exploding box of cherry bombs. Anyway, I will likely have more to say about this event in the coming days. My paranoia aside – there were no visible efforts to keep anybody away from the pilgrimage. The crowds were large and enthusiastic and – unlike me – didn’t seem particularly concerned about all of those earpieces. As I post this – it’s 11:30 AM here – the basilica’s mass should be ending. This entry was posted in Catholicism, Et Cetera, Media, Religion by Adam. Bookmark the permalink. Its probably inappropriate to say so but that took balls to go there like that. 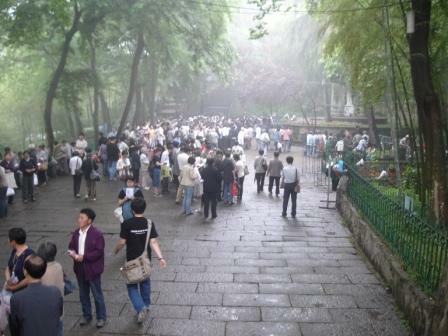 Traditionally, May pilgrimages should have some element of hardship associated with them, such as inclement weather. This particular one seems to have met that criteria. No doubt the people of Sichuan will appreciate the effort made. ago but not as many people like that. 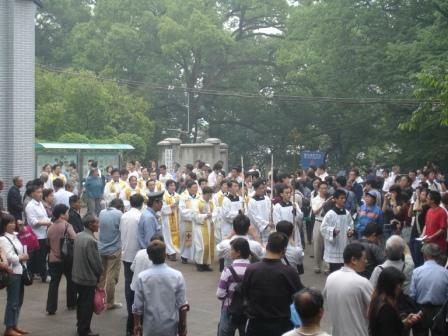 for others who want to see more photos open asia catholic news website ,there are a lot photos of the celebration there .